Kyla Mandel Editor of Desmog UK has been investigating the hidden contriving between shady fossil fuel lobbyists, prominent climate deniers, secretive think tanks, false news propagandists and government figures to subvert the unprecedented global consensus to tackle climate change of the Paris Agreement signed last year to achieve a crucial reduction in global warming. Let’s face it, Donald Trump could pull out of the Paris climate deal any day now and the UK could soon be left without any European environmental regulation backstop. In the blink of an eye both countries could hurtle back to when fossil fuels were king, the air was dirty, and climate targets were just a figment of hippies’ imaginations rather than the backdrop to smart business deals. Just 13 months after 195 nations agreed the landmark climate accord to curb global warming, you could be forgiven for wondering ‘how the hell did we get here?’. The Paris climate deal has long been in Trump’s cross-hairs, and now efforts are rapidly ramping up in Britain – a country with a long record of climate leadership – to push for the US to ditch the deal during the critical first few weeks of Trump’s presidency. To better understand this renewed attack against the climate agreement, and what it might actually mean if Trump decides to withdraw from it, it’s important to recognise the coordinated efforts to derail climate action, and those at the forefront of this push. Climate science deniers on both sides of the Atlantic are working in concert to whip up a media storm to spread doubt and misinformation amongst the public about climate science. Let’s start with Myron Ebell’s visit to Europe. 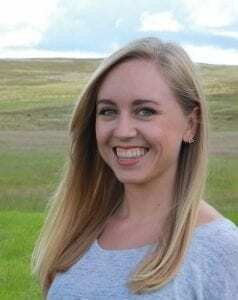 Until recently Ebell has remained mostly behind the scenes working for the Washington D.C.-based libertarian think tank, the Competitive Enterprise Institute (CEI) as director of energy and environment. The CEI is known for its climate science denial and being funded by Exxon and other groups tied to the fossil fuel industry. But in November, Ebell was thrust into the spotlight (perhaps somewhat reluctantly judging by his lackluster media appearances) when he was picked to lead Trump’s transition team for the Environmental Protection Agency (EPA). Fast-forward to January, and Ebell is making headlines in the UK saying Trump “will definitely” pull out of the Paris Agreement. He then appears at a press conference in London on 29 January hosted by UK climate science denying think tank the Global Warming Policy Foundation (GWPF) to repeat this same message. There’s one hitch though — he is no longer part of the administration. And during the press conference he even admitted to never having met Trump or spoken with him. So how much weight do his claims to know what Trump will do really hold? The next day, Ebell was photographed leaving Number 10 Downing Street. What he was there to discuss isn’t clear, but it paints a picture of high-power access. What we do know is that since he is not part of the Trump administration anymore, this means the UK Government met him solely in his capacity as a member of CEI. This serves to further entrench the US-UK climate science denier ties to both administrations as first documented by DeSmog UK. Ebell then took his anti-expert rhetoric to Brussels. The EU is another negotiating bloc known for its leadership on climate change. And Ebell’s message was not well received. Senior conservatives wasted no time in criticising his attacks on scientific expertise. Former UK energy minister Greg Barker pleaded with Ebell to “please, please stop trashing experts. It is an incredibly dangerous thing to do”, while EU climate chief Jos Debelke rejected Ebell’s calls to ignore scientific expertise saying “the evidence brought to the table by scientists is absolutely important” for formulating rational, evidence-based policy decisions. Undeterred by Ebell’s frosty reception, the attacks continue. The next big push against the Paris Agreement came on 5 February with an article by David Rose in the Mail on Sunday. The piece claimed to have found “astonishing evidence” that a scientific paper based on “flawed” evidence, that was apparently never shared, was “rushed” in order to influence the landmark Paris climate change negotiations. But almost immediately after publishing, the article’s many misleading claims were being called out online by scientists and international climate negotiators. A thorough debunking was published by Berkeley climate scientist Zeke Hausfather on Carbon Brief, who said the claims were “so wrong it’s hard to know where to start”. As it turns out, the editor of Science, where the paper was published, told Rose that “any suggestion that the review of this paper was ‘rushed’ is baseless and without merit”, and that the paper “underwent particularly rigorous peer review”. But by then the Mail on Sunday’s fake climate conspiracy had made its way around the Twitterverse, and was being echoed by key supporters such as Times columnist Matt Ridley, who sits on the academic advisory council of the GWPF, founded by former chancellor Nigel Lawson. The misinformation made its way over the ocean and swiftly – almost too swiftly – into Congressional hearings on the future of the National Oceanic and Atmospheric Administration (NOAA) which is responsible for a lot of climate research in the US. House Science Committee chairman, and known climate science denier, Lamar Smith, said the article’s so-called revelations justified his probe into NOAA. These efforts are simultaneously calculated and clumsy. Built on a foundation of misinformation but treated as fact. And repeatedly echoed by far-right media outlets including Breitbart, the chief executive of which, Steve Bannon, is now Trump’s right-hand man. From day one Trump has surrounded himself with a cabal of climate science deniers and he himself has called for America to “cancel” the climate deal. Yet on the other hand, former Exxon CEO and newly appointed Secretary of State Rex Tillerson recently said the US should keep “a seat at the table” when it comes to international climate talks (while at the same time downplaying the responsibility of humans for causing the rising temperatures). It’s a strange world when a Big Oil man, who’s foreign policy decisions appear to be in line with Exxon and Russia’s oil interests, is the ‘strongest’ voice of support for the Paris climate deal within Trump’s inner circle. These mixed messages make it difficult to know which way the administration is leaning and even more difficult for those trying to implement policy or for investors looking towards the future. One early hint at potential changes to come was seen on 3 February when the EPA quietly removed a reference to UN climate cooperation from its website. But even if this network of climate science deniers gets its way it could still be hard for President Trump to immediately kill all the US’s climate commitments. As Client Earth explains: “The Paris Agreement is an international treaty and now that it has entered into force, it cannot simply be ‘cancelled’ by the United States. One nation cannot single-handedly destroy the deal. So it seems that one option could simply be that Trump does nothing. He doesn’t leave the deal but doesn’t act on it either. This would have the added PR benefit from the administration’s point of view of being able to cater to both sides; Trump would be able to say he decided to stick with the Paris Agreement while also demonstrating to his supporters that he is ignoring America’s commitments under it. Either way, it opens the floodgates for even more US fossil fuels to be pumped and burned into the atmosphere, with far-reaching and long-lasting international impacts. It would also leave room for other countries to take up the climate leadership baton dropped by the US – an opportunity already being seized by China, the world’s leading producer and consumer of renewable energy technologies. But it’s not a sealed deal – Britain recently reiterated its commitment to its Climate Change Act and the Paris Agreement in its Brexit whitepaper and Europe has said it will continue to lead on climate change despite any decisions taken by Trump. 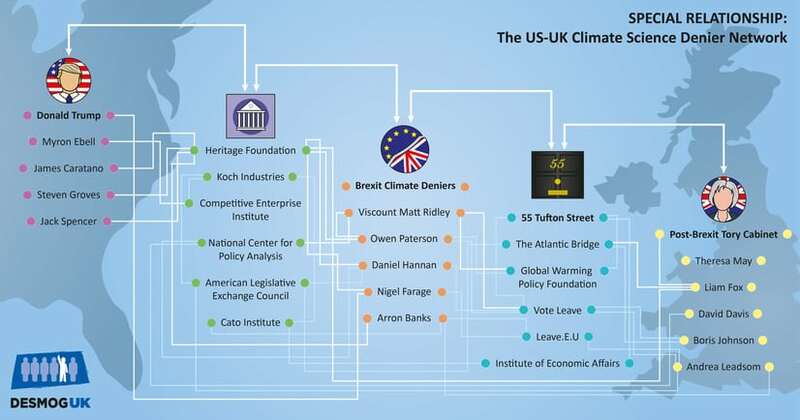 It’s still early days though and this emerging UK-US network of climate science deniers is using the political chaos created by referendums and elections as an opportunity to shape the outcome before the dust settles. As new information, executive orders, and analysis continues to roll out hour after hour, day after day, things might feel like they’re moving too quickly to predict what could happen next. But, beneath the surface, those with an interest in attacking the spirit of the climate agreement are steadily taking advantage of the frenzy floating above. Glo-Bull Warming is the biggest fraud ever perpetrated in human history. CO2 is not a pollutant and is necessary for photosynthesis which gives the atmosphere life sustaining oxygen. Oil, coal and natural gas are organic. To those fervent believers in the Cult of Glo-Bull Warming, do your part to reduce atmospheric CO2……………just stop exhaling. Like all climate-change deniers, you have no understanding of the actual science behind it. Yes, plants absorb CO2, but we’ve cut down so many trees and pumping so much CO2 into the air that we’re we’re producing more of it than they can absorb. Excess CO2 in the atmosphere traps heat just like the glass in a greenhouse, hence “greenhouse effect”. Rising global temperatures are well documented, and the overwhelming majority of climate scientists are in agreement about its causes and effects. Oil, coal and natural gas are organic compounds sure, but that’s not the same meaning as the word “organic” when applied to fruit and veg. Dioxins are organic compounds, but just a few micrograms are lethal. Learn what words mean before using them to bolster your argument. If you’re going to join in the discussion, at least learn some actual facts, not the bullcrap touted by the anti-science lobby. I wonder how much funding Desmog UK gets from George Soros? Like most NGO’s with a leftist bent, you are delusional that the fossil fuel industry are conspiring to corrupt climate science. The shoe is on the other foot and it is becoming more obvious every year. Randy, it’s actually hilarious that you’ve just shared that ‘source’. I doubt you can even see the irony. “In association with David Icke dot com!” Well, as long as you’re quoting such credible sources I’m sure you’ll win this argument.